Bach’s so-called Mass in B Minor is a paradox in musical history. Firstly, it’s not a mass for liturgical use. While the work covers the text of the Latin Ordinary – those parts of the mass for which the words remain the same throughout the liturgical year – it was never intended to be performed all together. It consists of several compositions dating from different time in Bach’s life, which the composer eventually collected into a single package as a kind of audition portfolio for prospective jobs. And despite the traditional nomenclature, the predominant key of the collection is D major. As a concert piece it’s quite long (approximately 2 hours of music, not counting intermissions) and very difficult, technically and interpretively. It’s also a very great piece of music, in parts or in its entirety. On April 12, the Gaechinger Cantorey – the 31-voice choir and similarly sized period instrument orchestra of Stuttgart’s Internationale Bachakadamie – performed Bach’s B Minor Mass in Broward Center’s Au-Rene Theater. It was a thoroughly riveting experience, because of the consistently high quality of the performance, led by conductor Hans-Christoph Rademann, and the cumulative emotional impact of the entire event. One moment in particular stands out in memory. The gravest single section of this work is Bach’s setting of the “Crucifixus,” a slow passacaglia (variations over a repeated bass line) in which time seems to stop. 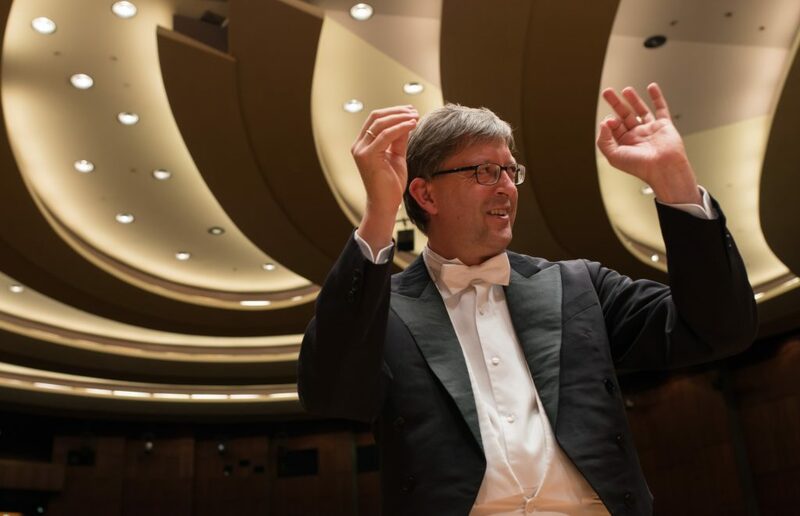 At the movement’s end, without pause, Rademann made a turnaround attack on “Et resurrexit,” a jubilant outburst with trumpets and timpani that changed the mood to joy and exhilaration. It was a breathtaking effect. Another interesting touch was Rademann’s phrasing of the opening “Kyrie” fugue subject. The line includes a 12-note melisma, which Rademann separated into two and four-note arcs that gave the phrase new meaning and set the tone for the entire movement. The bass’s chorale-like statement of “Quoniam” – accompanied by horn and two bassoons – is totally unlike the soothing pastoral rhythm of his “Et in spiritum,” which in turn, is later transformed into a rollicking gigue on “Sanctus.” Rademann brought out the unique character inherent in each individual movement. But the choir is the star in any performance of the B Minor Mass. The ensemble inevitably performed with the synchronicity of a single voice, each section delivering its lines with clarity so that inner melodic lines were no less prominent than those of the basses or first sopranos, and just about every word emerged with lucidity. The orchestral accompaniment is basically strings and basso continuo (cello and organ, here). Winds and brasses are used for obbligatos and special effects. Their instrumental soloists were wonderfully virtuosic – principal violinist Mayumi Hirasaki making her mark in the exquisite “Laudamus te,” a concerto-like duet with mezzo-soprano Roxana Constantinescu, the most accomplished among the vocal soloists. The mezzo excelled in long-breathed phrases matching those of her violin cohort, later coloring her lovely sound for the sadder expressive needs of “Qui sedes” and the eloquence demanded in “Agnus Dei.” Her only fault (and she was not alone in this) was the typical German mispronunciation of “qui” (and similar Latin words) to come out “KVEE” almost every time. There were two tenor soloists, allotted a single number each. Bright-voiced Jakob Pilgram was an asset in the “Domine Deus” duet with solid soprano Regula Muehemann, but Benedikt Kristjansson’s minuscule white sound – perhaps chosen for a similarity of timbre to the obbligato flute in “Benedictus” – was a jarring oddity that didn’t work.